Whenever a spell or ability causes its controller to shuffle his or her library, that player puts a card from his or her hand on top of his or her library. Nim Deathmantle gives intimidate. It's unlikely that all 3 opponents will have an artifact/black creature with which to block, so 14 damage (and thus 14 mana) can be fairly safely assumed on the combo turn barring creature/artifact removal or stax disruption. Nim Deathmantles color-changing and type-changing effects override the equipped creatures previous colors and creature types. After Nim Deathmantle becomes equipped to a creature, that creature will be a black Zombie, not any other colors or creature types. Skirk Prospector cannot sac non-goblin zombies. Thermopod is too difficult to tutor with Heirloom Blade. Argentum Armor comes down AND attaches itself to Godo for FREE. It can destroy 2 permanents per turn, which is a great plan B if stax pieces are hosing the Kiki combo, especially for extra turn wins. Please give additional feedback on why this shouldn't be included. Dowsing Dagger 's primary purpose is to provide mana to cast Last Chance if we've tapped out to equip Blade of Selves. Sometimes we won't have the 2 mountains needed for Sword of Feast and Famine. 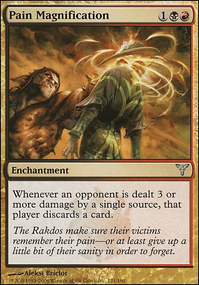 Aggravated Assault does provide great synergy, but it's also very obviously threatening, hard to cast before Godo if we're running rituals, and hard to activate without Dowsing Dagger before turn 5. Dowsing Dagger can also be attached to smaller creatures to provide ramp. This deck needs 6 or 8 mana or more at once, not 4 mana in both main phases. I'm open to swapping out Pyrokinesis, but it hits all the stax creatures we need for 0 mana, and surprises LabMan combos with a loss when we're tapped out. 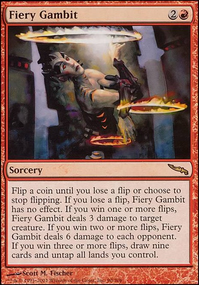 "Do you ever see it in cEDH" isn't the best argument for tuning a mono-red deck that's actively burning cards for gas. 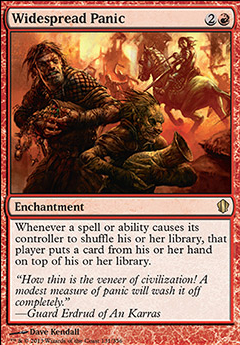 Possibility Storm is in the Ruric Thar, the Unbowed deck on your list. While I understand it synergizes with Thar's ability, it doesn't affect our game plan in the slightest and creates a mess for most other decks. Do you think it's not powerful enough to warrant playing? I'm open to swapping it out, but it seems as debilitating as landing Blood Moon. Winds of Change and Widespread Panic are in the deck to shuffle equipment back into our library where we want it. The deck goes off a turn or two slower if it ends up drawing Nim Deathmantle or any of the other combo piece of equipment we need. 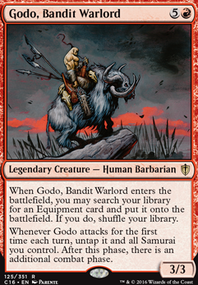 Winds of Change is in the Purphoros, God of the Forge deck on your list, which is the highest tier a mono-red deck is listed in. 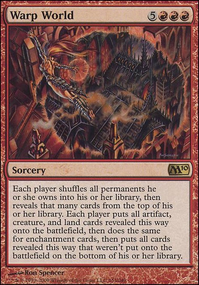 Widespread Panic is a flex spot, so I'd be open to cutting it if it underperforms, but it hoses top-deck tutors and generally punishes fetch-lands and tutoring in general. By the time we're tutoring with Godo we shouldn't need cards in hand. Aven Mindcensor makes our deck useless. Abrade kills that. It kills opponents' creatures about to win them the game. It's in a lot of top tier decks. It fires at instant speed. It seems like the best artifact removal we can run. Mogg Salvage is a flex spot. It's is in the deck because it can remove a stax piece for free on the combo turn (when we need gas) and occasionally ruin someone else's combo when we're tapped out. I could be swapped out. Thorn of Amethyst could be cut. It's main purpose is to fight Counterspells and to slow people down. Lightning Greaves are awful in this deck. They prevent Hammer of Nazahn from targeting Godo. You can't equip things to creatures with shroud. I'll have to test rituals vs. rocks. Right now I'm embracing this list as a glass-canon, similar to Sidisi, Undead Vizier. Aggressive mulligans often lead casting Godo, Possibility Storm, Blood Moon, or Magus of the Moon by turn 2. Basalt Monolith, Worn Powerstone, and Voltaic Key are at the top of my list for rocks to add because they net the most mana for least cmc. Fellwar Stone and Everflowing Chalice are already in the deck. I've run Panharmonicon and Strionic Resonator in earlier iterations of the deck. Panharmonicon is hard to combo with casting Godo quickly, it usually takes an extra turn at best, at which point why bother? Strionic Resonator effectively makes Godo cost 2 extra mana to cast to provide any value. Magus of the Moon has been in the deck since inception, you must have missed it. Widespread Panic is being ran. I need to update this list tonight. Optimator on Chaos is coming... all over your deck. Impulsive Maneuvers, Widespread Panic, Custody Battle, Wild Ricochet, Sulfuric Vortex, Five-Alarm Fire, Fighting Chance, Heartless Hidetsugu, Bearer of the Heavens, Wildfire, Charmbreaker Devils, Flame Fusillade, Antagonism, Wild Evocation, Starke of Rath, Sin Prodder, Incite Rebellion, Scrambleverse, Tyrant of Discord, Smoke, Vulshok Battlemaster, Winter Sky, War Elemental, Power Surge, Galvanoth, Grand Melee, Mages' Contest, Chain Reaction, Breaking Point, Witch Hunt, Howl of the Horde, Thieves' Auction, Aftershock, Guttersnipe, Goblin Diplomats, Curse of Stalked Prey, Mob Rule, Mass Mutiny, Ash Zealot, Warp World. I know a lot of those are more stax-y and group-slug-y than chaotic but some of them are quite chaotic and some of them force opponents to do something they don't want to do. 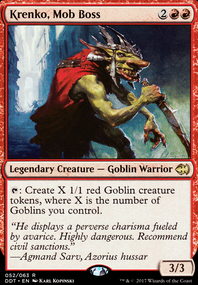 Some cool red enchantments to consider! Bitter Feud, Burning Earth, Confusion in the Ranks, Curse of Bloodletting, Dictate of the Twin Gods, Heat Stroke, Stranglehold, Tide of War, Vicious Shadows, Widespread Panic, etc.